THERMEC’2018 is the tenth international conference on advanced materials series built upon the proven concept and continues the tradition of its nine predecessors, Japan (1988), Australia (1997), USA (2000), Spain (2003), Vancouver, Canada ( 2006), Berlin, Germany (2009), Quebec City, Canada (2011), Las Vegas, USA ( 2013) and the last THERMEC’2016 in Graz, Austria. This conference series provides a forum for researchers around the globe to present papers on recent advances in the overall field of science and technology of processing and manufacturing of advanced materials. The Conference will cover all aspects of processing, fabrication, structure/property evaluation and applications of both ferrous and non-ferrous materials, composites including biomaterials, fuel cells/hydrogen storage technologies, batteries, supercapacitors, nanomaterials for energy and structural applications, aerospace structural metallic materials, bulk metallic glasses and other advanced materials. In addition, a special symposium on Cold Spray is being organized for the first time in association with CEA. Oral and poster presentations dealing with the various conference topics listed in this circular will be included in the conference program. In addition to the contributed presentations, the conference committee has invited eminent internationally known researchers in key areas of advanced materials processing/manufacturing from various countries to deliver Plenary/Keynote lectures at THERMEC’2018. THERMEC’2018 will be held at the Cite des Sciences et de l'Industrie, built on the site of former abattoirs and designed by the architect Bernard Tschumi, the Parc de la Villette is the largest urban cultural park in the capital. 55 hectares of park, of which 35 are open-air, mix nature and modern architecture, playgrounds and activity areas for children and adults, cultural spaces and theatres. Open from 6am to 1am, the park is accessible by metro, bus, foot, bicycle and even boat. Visitors can stroll along the canal de l'Ourcq where there are a number of green spaces, ponds and fountains. 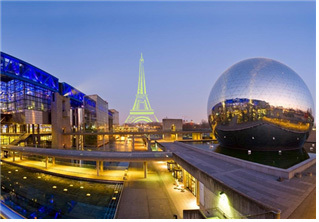 There are also numerous cultural attractions such as the Cite des Sciences et de l'Industrie, the Geode, the Zenith de Paris, the Musee de la Musique, the Philharmonie de Paris. Every year, exceptional events are organized here, like the open-air film festival, which is held from mid-July to mid-August.